Here are five simple fine motor activities for Thanksgiving that you can do with preschoolers. Tweezer Sorting: Provide children with Thanksgiving Harvest Mix Bead Assortment, some fine motor tweezers, and a veggie tray from Dollar Tree. Have kids use tweezers to pick up and sort the various beads into the divided tray. Turkey Lacing: Cut out a turkey shape from cardboard or thick paper. After children decorate it, add holes around the edge for children to lace. Golf Tee Turkeys: Make some brown playdough, add some googly eyes, and a playdough beak and wattle. Let children push colored golf tees into the playdough for the feathers. Turkey Baster Painting: Water down (a little water) some fall-colored paints. Dip a turkey baster into paint, squeezing the paint into the baster. Then squeeze the paint onto paper to make a turkey baster painting. Why is it important to help children develop their fine motor skills? July 15 is Cow Appreciation Day. Here are some fun activities to incorporate into your child care program that involve cows. “Milk” Cows – Fill latex gloves with milk and tie them shu. Poke small holes in the fingers of the gloves. Hang the gloves under a small folding table or chair with a bowl underneath. Have children squeeze and pull the fingers to get the milk out, and they will see how it is to really milk a cow. Cow Spots Sponge Painting – Have children dip shower loofahs into black paint and dab on white paper. Favorite Milk Graph – Talk about how milk comes from cows and create a class graph of favorite flavors of milk: plain, chocolate, or strawberry. Make Ice Cream in a Bag – Use milk along with the other ingredients listed here, to make ice cream in a bag. Since July is National Ice Cream Month, it is also a good tie-in during Cow Appreciation Day! Cows are also known as cattle. Cows are herbivores meaning they eat grasses, plants, corn. They do not eat meat. There are many types of cows. Cows are smart and intelligent animals. They are also social animals and interact with other cows. Cows say “moo” as a way to communicate. A male is called a bull. A female who has given birth is called a cow. A female who has not given birth is called a heifer. A baby cow is called a calf. There are over 1 billion cows that live in the world! Cows live on every continent except Antarctica. Did you know that September 22 is National Elephant Appreciation Day? It is a good opportunity to introduce young children to the world’s land animal! Elephant Weight – Tell children them how much a baby elephant weighs (200 pounds). Weigh each child, record their weight, and see if it would take the whole class to weigh as much as a baby elephant. 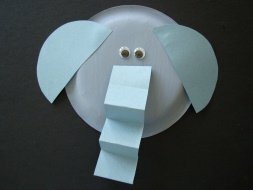 Pass the Peanut – Tell the class that they are going to pretend to be elephants. Give each child a sock to put on his or her hand (this is their trunk). Have children sit in a circle and give one child a peanut (a real peanut or a packing peanut if there are allergies). Have the children pass the peanut from person to person until it comes back to the start. Use a timer to see how long it takes and then do it a second time to see if they can beat their time. Paint like an Elephant – Elephants have been know to paint using their trunks, so challenge your kids to hold a paintbrush in their sock trunks (from activity above) and create a picture. There are two types of elephants – African and Indian. African elephants are larger than Indian elephants, they have baggier skin and bigger ears, too. Elephants live together in families. Several families living together form a herd. The leader of the herd is usually the oldest female, called a matriarch. Elephants eat plants. They eat a lot of plants! Elephants flap their ears to cool themselves. Elephants spray water on their skin. The wrinkles hold the water, which helps to cool them. Elephants live for eighty years! Elephants have four teeth and two tusks. Here are some ideas for Groundhog Day Activities with preschoolers. The day before, create a graph about children’s guesses – Will the Groundhog see his shadow or not? Get a Ground Cookie Cutter and make Groundhog Cookies…or use the cookie cutter to dip in paint and make Groundhog prints. Add flashlights to the block area. Allow children to build towers, then create a shadow with the flashlight. Make a Groundhog Day Dirt Pie – Make a box of instant chocolate pudding, according to directions, and place into small bowls. Crush chocolate graham crackers squares (crush until it looks like fine crumbs or dirt) and sprinkle on top of the pudding in each bowl. Glue a small picture of a groundhog on a Popsicle stick. Place in the center of the bowl of pudding.